I have no doubt that every single one of you will be able to ID this famous location in a split second. I'm just happy I was able to see it in real life (despite a giant security fence limiting closer access, which would have given me a better shot for this column). Now, let's talk about the movie! 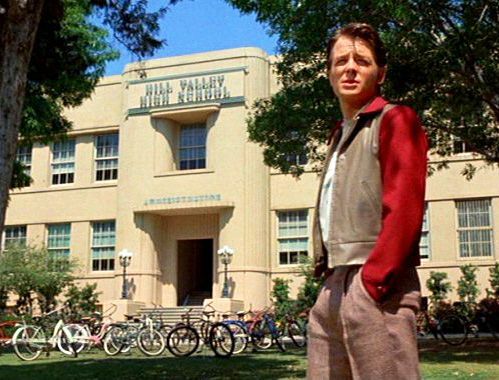 I wanna say Hill Valley High School, but I don't remember the entrance being chamfered like that, I remember it having a 90-degree angle. However, the fenestration pattern and centered second story window looks right. Hill Valley High is my final answer. Oh! We got F This Architecture ovah here! Nuke 'Em High. I can tell by the spray paint. Close the thread. Great photo, Ivan. You (and Joseph and Brian and El Gaith) are right! 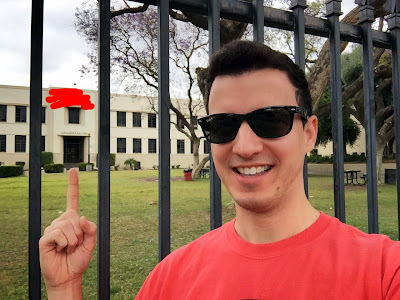 This is Whittier High School on Philadelphia Street in Whittier, CA, A.K.A. Hill Valley High School from BACK TO THE FUTURE. I felt like a creep trying to get this photo. It's a functioning high school surrounded by a wrought-iron fence. I was circling the perimeter for about 15 minutes looking for the right angle (I failed). Some kids gave me weird looks. WHATEVER.